Save up to 80%* of your hot water bill… whatever the weather! SA Hot water are your local Adelaide Sanden specialist for sales, and great prices on Sanden hot water systems. Call today on 8444 7320 for a great deal or check out our range of Sanden Heat Pump Systems. 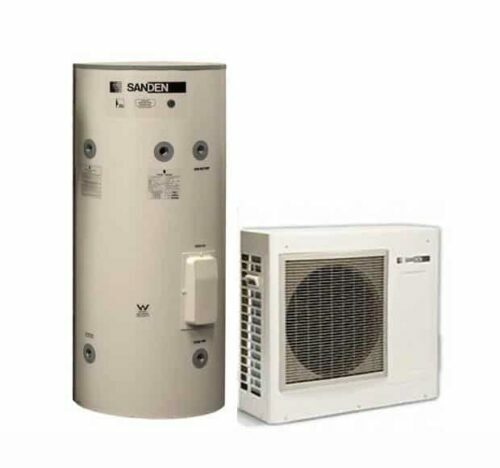 The Sanden Eco® system is the most energy efficient hot water heat pump currently available. Buy a Sanden system and receive the highest amount of Small-scale Technology Certificates (STCs) of any currently available hot water heat pump system. These STCs can be used to reduce your purchase price. Why purchase a Sanden Eco® Hot Water Heat Pump System? Best in class energy efficiency using only 22% of the energy compared to an electric storage hot water system. Innovative technology – up to 50% faster heat recovery than other Hot Water Heat Pumps. Use with Off-Peak Electricity for even greater savings. The most STC credits for energy efficiency, giving you a greater discount on the purchase price. Excellent warranties, backed by Sanden’s 30 years of operation in Australia. Split system for ease of installation and near silent operation. The table shows electricity consumption figures from a Sanden customer, who replaced his conventional electric Rheem Hot Water System with a Sanden Hot Water Heat Pump System, on 4.10.10. He lives in the Sydney Metro area, has a family of 4 people (ie. Husband, Wife & 2 x Children) using hot water and uses Off-Peak Controlled Load 2. As can be seen, the reduction in usage achieved for the 2010/11 period, versus the same period a year previous, was approx. 80%, while the reduction in $$$ for the same period was 77% and this was despite a change of supplier and a more expensive tariff (ie. increase of 18.7%). High quality, Australian made extra long life stainless steel cylinder. Safety pressure and temperature relief valve supplied. Sanden Hot Water Best Price!